I had a bunch of extra filling and icing from Grandma’s Easter Nutrolls, so I decided to make something different out of them. I had crescent rolls and was very happy with the results. 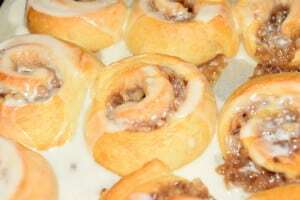 My Grandma’s Easter Nutrolls are the best, but sometimes I don’t have the time or energy to make the dough, let it rise, make the rolls, let it rise, bake, cool, ice, etc. It is a lot of work. Is it worth it? Yes! But, there are times when quick is best. When I made these, I had leftover filling and icing. I didn’t want to throw it out, so, I came up with this recipe. I suggest you make the filling and icing a couple days in advance so that you have a super quick dessert. The filling can be frozen (the icing not as much). I had a bunch of extra filling and icing from Grandma's Easter Nutrolls, so I decided to make something different out of them. 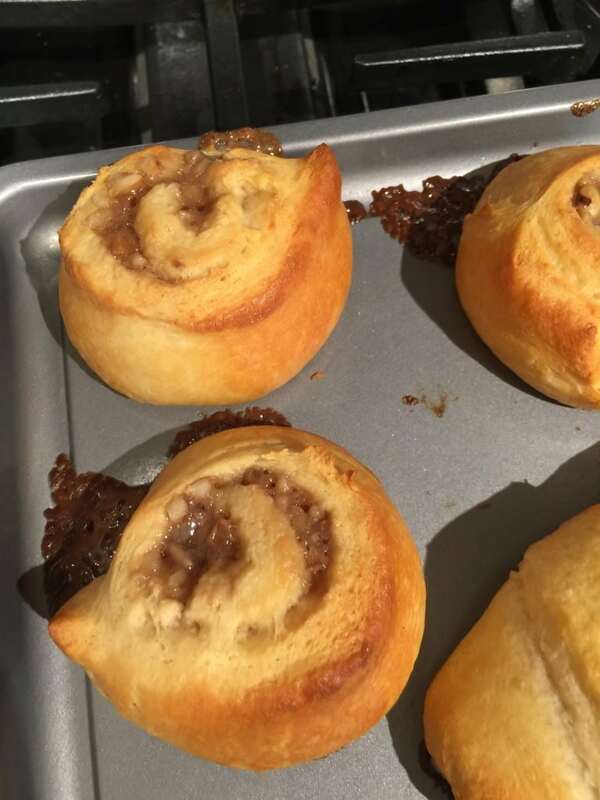 I had crescent rolls and was very happy with the results. Refrigerate leftovers and heat in microwave for 15 seconds to warm up. Make the walnut filling first so that it has time to cool fully before using. Mix all ingredients in a saucepan and bring to a boil. Turn down heat and simmer for about 5 minutes, stirring occasionally. Cool to room temperature before spreading on the rolled out dough. Reserve at least 2 egg whites for the icing mixture. Blend the butter, egg whites and vanilla extract in a bowl. Gradually stir in the powdered sugar. Adjust with a little water or powdered sugar as necessary for a smooth creamy texture. Set aside. Roll out the crescent rolls in rectangles of 2. Place walnut filling on 3/4 of the dough as shown. 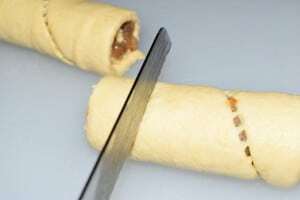 Once rolled up, slice each roll into 4 equal pieces by making one cut down the center and then two other cuts between the center and ends. Place dough rolls flat on parchment paper and bake at 350 degrees for 15-20 minutes, or until crescent is cooked all the way through. Let the nutrolls cook for 2-3 minutes. 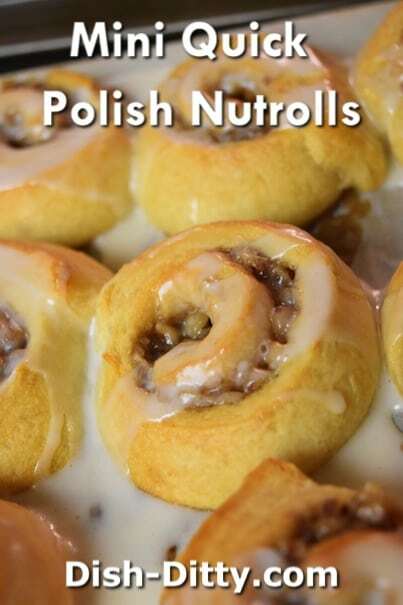 While the nutrolls are still warm, spread icing generously. Serve warm. Warm it up: These are so delicious when warm. Just heat a slice of the nut roll in the microwave for 10-20 seconds. Can be frozen: These work well frozen (best without icing). Just bake, cool, and wrap tightly with plastic wrap before freezing. 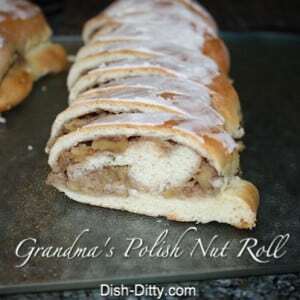 Grandma's recipe: My grandma's recipe's instructions just said "Spread walnut filling on sweet dough: roll and bake". This is my mom's version with a little more instruction! 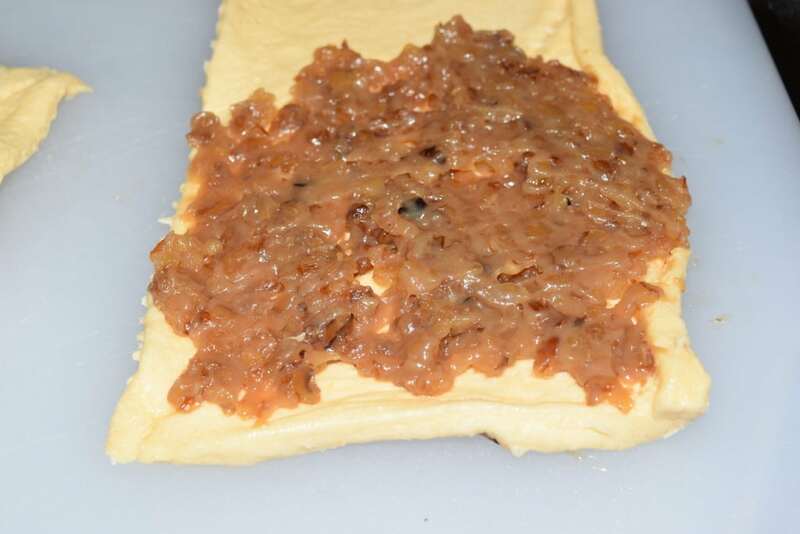 Variation 1: The walnut filling is perfect as a filling for shortbread tartlets, topped with a little melted chocolate. Variation 2: Suz came up with a variation that is also delicious. 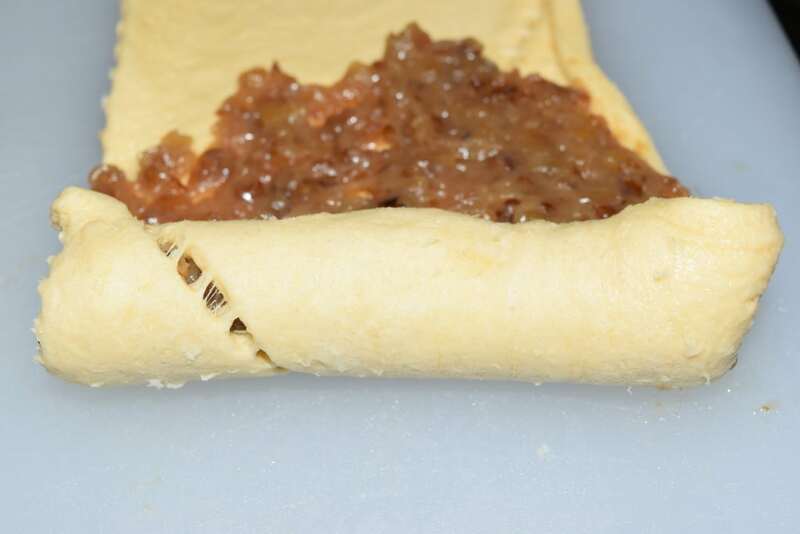 Take a well gelled pie filling or jam and spread on the sweet dough and roll up as normal. Make sure the dough isn't rolled out too thin for this variation otherwise the dough stays too wet and won't bake all the way. Cool and ice the same as regular nut roll. Make the walnut filling first so that it has time to cool fully before using. Mix all ingredients in a saucepan and bring to a boil, it will take some time to come to a boil. Turn down heat and simmer for about 5 minutes, stirring occasionally. Cool to room temperature before spreading on the rolled out dough. Reserve at least 2 egg whites for the icing mixture. Scald milk (heat until bubbles start to form) in a saucepan (or microwave, approximately 90 seconds). Remove from heat and stir in sugar, salt and butter. Stir until the butter is completely melted. Cool to lukewarm. In a large mixing bowl, dissolve the yeast in the lukewarm water (100-110 degrees) and add in about 1 Tablespoon of sugar. Allow to sit until mixture starts bubbling (this is called proofing the yeast). Stir in the milk mixture followed by the eggs, whiskey and then the flour, added one cup at a time. Add the flour until a soft elastic dough forms. If using a stand mixer, use the paddle for the first 4-5 cups and then switch to the dough hook. Once you have added all the flour, knead the dough either by hand or in a mixer with a bread hook for about 5 minutes. Put the dough into a greased (Crisco, butter, or olive oil) bow, cover with a damp towel and let raise until doubled in bulk (between 30-45 minutes). Punch the dough down after doubling, then separate (pull or cut) into nine equal portions. Keep the portions of dough waiting to be rolled covered with a damp towel. Form one of the portions into a ball (about the size of a softball). Roll out the ball on a floured board into an 18 inch round pizza pie shape. 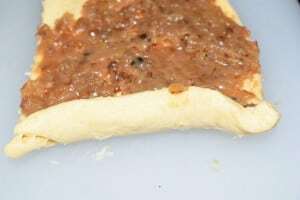 Spread a generous portion of the walnut (see below for recipe), on the surface of the dough, leaving about 1 inch of dough without filling so you can make a seam when rolled. Roll up into a long loaf, being sure to end the roll on the filling-free side. Place the roll, seams side down, onto a greased (with Crisco or Pam) cookie sheet, leaving some room in between the rolls to raise, cover with a damp towel, and allow them to raise until doubled in bulk (about 30 minutes). **About 2 rolls per cookie sheets will allow enough room for raise without touching. 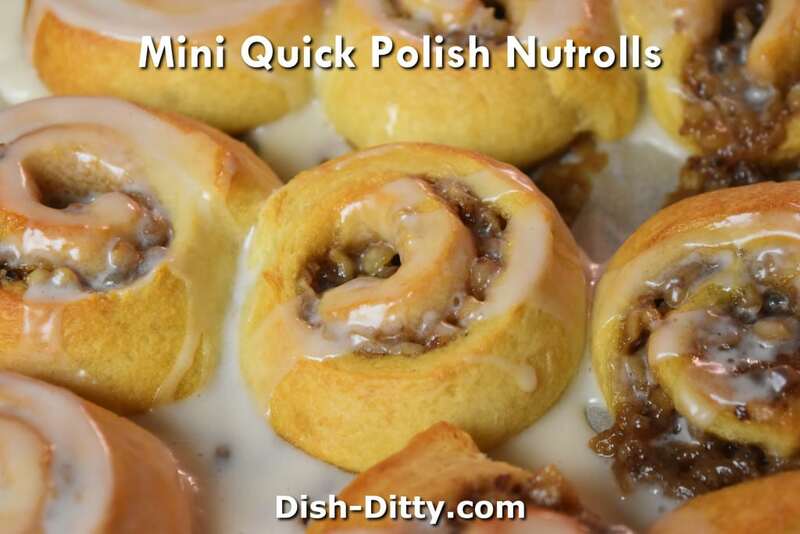 If the rolls touch, you are likely to have walnut filling leaking through and the dough in that spot won't be done. Once doubled, make sure there is still room between each rolls to allow for further rising in the oven during baking. Bake at 350 degrees for approximately 18 minutes until golden brown on top. Cool and ice with the icing mixture below. Blend the butter, egg whites and vanilla extract in a bowl. Gradually stir in the powdered sugar. Adjust with a little water or powdered sugar as necessary for a smooth creamy texture. 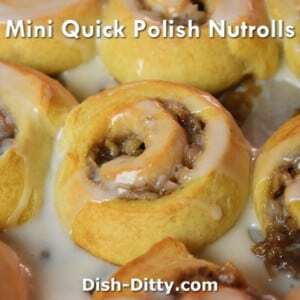 2 Replies to "Mini Quick Polish Nutrolls Recipe"
Good Afternoon, I was looking for Nutrolls online and came across this recipe. How much walnuts do I use in the mixture. I added the original recipe for your reference.